Maple Leafs general manager Kyle Dubas wasn't specifically looking to add a woman to Toronto's front office. 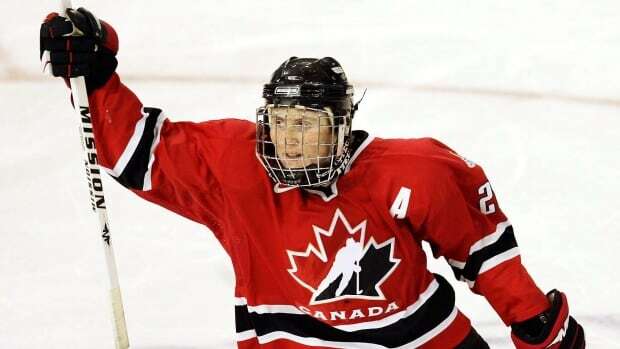 Hayley Wickenheiser was simply the best fit. One of the top players in women's hockey history, Wickenheiser was named the club's new assistant director of player development Thursday. The four-time Olympic gold medallist will monitor Leafs prospects in the WHL, and is expected to travel to Toronto a couple times a month to work with players on both the Leafs and the AHL's Marlies. "The biggest reason why I was intrigued about this role is that Kyle was interested in me — not to hire a woman, but to hire someone who could do the job," Wickenheiser said on a conference call. "I feel pretty confident in my abilities to be in this role and that I belong and can handle myself with anyone." The 40-year-old from Shaunavon, Sask., retired as a player in 2017, finishing as the career leading scorer for the Canadian women's national team with 168 goals and 211 assists for 379 points in 276 games. "I know how those guys think, how they approach the game, day in and day out," she said. "I can help players get better and understand what it takes to get better. "Every time you step on the ice, whether it's with a player or a coach, you can always learn something or take something." Wickenheiser, who will continue studying medicine at the University of Calgary, said it was important for her to get back into a sport where she's helped blaze a trail for women and girls. "I love being around people that are the best at what they do," she said. "To work for the Toronto Maple Leafs is a pretty huge honour, and it's a big responsibility. "I understand well what pressure is in playing for Canada on the world stage. Hopefully some of those experiences I've that had can help some of these players." Wickenheiser, the MVP of women's tournament at both the 2002 and 2006 Olympics, attended the Leafs' development camp as a guest coach in June. "When we go through any process of hiring people to add to our program, we're looking for the best people. Period," Dubas said. "Hayley was certainly the best person to fill that role because of her expertise in hockey, her experience of being an elite player at every level. "Getting to know her and talking to her, I just thought the way that Hayley thinks about hockey and life could be a massive benefit to our player development program, but also our program in general." The Leafs also announced Scott Pellerin has been elevated to senior director of player development and that Stephane Robidas will serve as director of player development, while Noelle Needham and Victor Carneiro have been brought onboard as amateur scouts. Dubas said adding more diversity to the Leafs — the team already employs former Olympian Barbara Underhill as a power skating coach — with hires like Wickenheiser and Needham can only help the franchise reach its ultimate goal. "Research shows that the more diverse your organization, the better your decision making, the better your operation in general," he said. "If you're only hiring white males, and I'm saying that as a white male, you're probably leaving a lot on the table in terms of where your organization can go and how it can think and how it can evolve and develop. "We're looking for the best candidates and we're not pushing anybody aside. I think sports in general are moving well in that direction." While a woman has yet to step behind an NHL bench, Becky Harmon has been an assistant coach with the NBA's San Antonio Spurs since 2014, while Kathryn Smith became the NFL's first full-time female assistant during the 2016 season with the Buffalo Bills. The NFL and NBA also employ female officials. Wickenheiser said that although she realizes the new gig is another step for women in hockey, and sports in general, her focus is more on doing the job properly than thinking about what it means. "It's about being competent and being good at what you do," she said. "I also understand that there will be a lot of young girls that will see this as knocking down barriers for them to maybe dream to do the same thing. "It does show forward-thinking, it shows young girls that they can really do anything, but at the same time there's a competency and a performance standard."